A hand painted needlepoint canvas (18 count) by Pat Thode comes with a stitch guide giving thread and stitch suggestions. (If it needs to be ordered, please allow 2-3 weeks to arrive.) 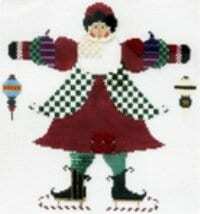 This Santa has a red skirt with a green and white overlay on skates made of candy cane blades. He is holding an ornament in each hand for balance. Embellishments included are jingle bells and brass star charms.